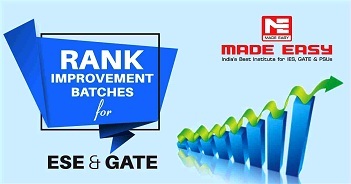 If you have appeared for GATE/ESE but did not get rank upto your expectations??? Repeating without a change in strategy is an invitation to the same result. Rank Improvement Batches are designed with a motive to provide more practice to students by focusing on numerical solving. Supplemented with exclusive workbooks having variety of questions, makes these batches a complete package to help repeater aspirants who have taken classroom coaching or prepared themselves for these exams to fill the gap and get ready for the next. Batches commencing from 20, May 2019. Note: 1.These batches will be focusing on solving problems and doubt clearing sessions. Therefore, if a student is weak in basic concepts & fundamentals then he/she is recommended to join regular classroom course. B.E./B.Tech. Pre Final Year/Final Year/Passed out Student. Passed Section A and B of the Institution Examinations of the Institution of Engineers (India). M.Sc. degree or its equivalent with Wireless Communication, Electronics, Radio Physics or Radio Engineering as a special subject (Only for Electronics & Communication Engineering Stream). Passed Associate Membership Examination Parts II and III/Sections A and B of the Aeronautical Society of India. Bachelor's degree holders in Engineering/ Technology/ Architecture (Post-B.Sc./Post-Diploma) and those who are in the final year of such programs. Master's degree holders in any branch of Science/ Mathematics/ Statistics/ Computer Applications or equivalent and those who are in the final year of such programs. Candidates with qualifications obtained through examinations conducted by professional societies recognized by UPSC/AICTE (e.g. AMIE by Institute of Engineers (India); AMICE by Institute of Civil Engineers (India)) as equivalent to B.E. /B.Tech. Those who have completed section A or equivalent of such professional courses are also eligible. 1 Self attested Copy of Photo ID Proof (e.g. Voter ID, Driving License, PAN Card, Passport, Adhaar Card). Photocopy of MADE EASY I-Card (Only for Ex. 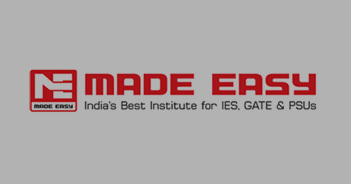 MADE EASY Students), M.Tech mark sheet, PSUs/IES interview call letter, GATE score card. Secured GATE rank up to 6000. Student can avail the fee refund facility within first 2 classes of the commencement of batch. Fee will be refunded after deducting initial processing and admission charges. Refund amount will be paid through account payee cheque only, which will be in the name of the candidate. Refund requests made verbally, over telephone, e-mail or by fax will not be valid or accepted. The refund and/or replacement application has to be submitted in person to the coordinator in the admission office by the student or parents only “Fee Refund” application. Please note that, we will not accept the Fee refund applications from any other person/relative/friend. The policy of fee refund is strictly according to the above mentioned terms and is not negotiable under any circumstances. Any refund of fee or seat replacement received without proper documents like ID-card (if issued), fee receipt & written application after the expiry of applicable period will not be processed or entertained. There is no provision of Replacement for this course.